Day 13: Edmonton, AB to Jasper, AB. Even though we were up at 6 a.m. and at breakfast with the car mostly packed by 7, we managed to stretch out our departure from Edmonton until 9 a.m., when we turned onto the Yellowhead Highway, a major east-west thoroughfare connecting the four western provinces of British Columbia, Alberta, Saskatchewan and Manitoba. 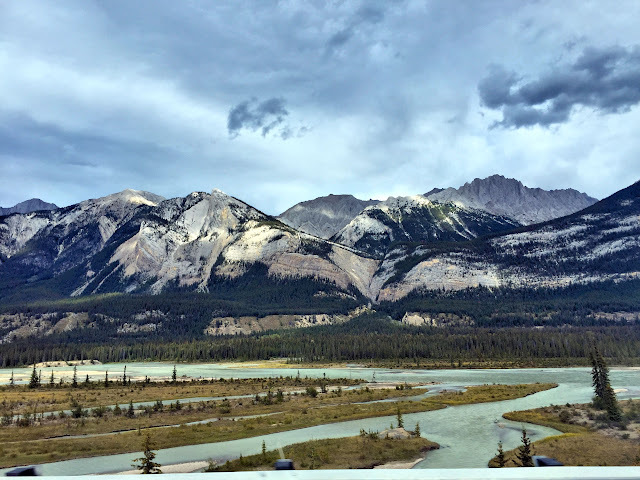 The highway was named for the Yellowhead Pass, a gap through the Canadian Rockies across the Continental Divide on the Alberta/British Columbia border within Jasper National Park. 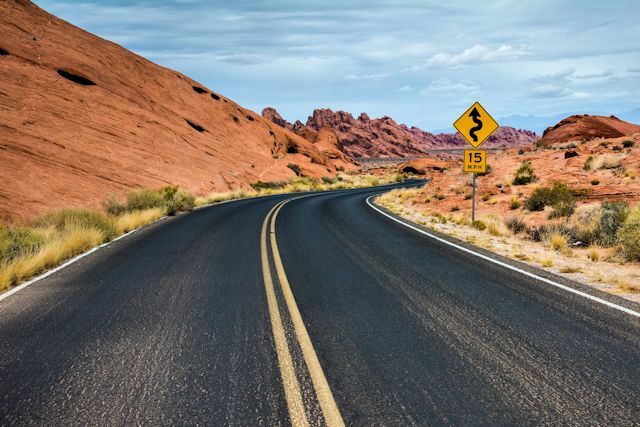 Yellowhead Pass takes its name from an early Iroquois-Métis fur trapper and explorer nicknamed "Téte Jaune" (yellowhead) for the blonde streaks in his hair. As we traveled west on the divided highway, the prairies gave way to thick evergreen forests. Tall, narrow spruce and lodge pole pines crowded up against each other to form thick barriers of dark green. Occasional stands of birch and other hardwoods intervened to add variety. Further west, the Canadian Rockies grew into view. By noon we had reached Hinton, 16 miles from the entrance to Jasper National Park, and the only place we were able to find a room for the night in this busy tourist season. The temp was holding just below 60°, and we were enjoying the energizing briskness after so much heat. Traffic thickened as we neared the entrance to the park often called the jewel of the Canadian Rockies. 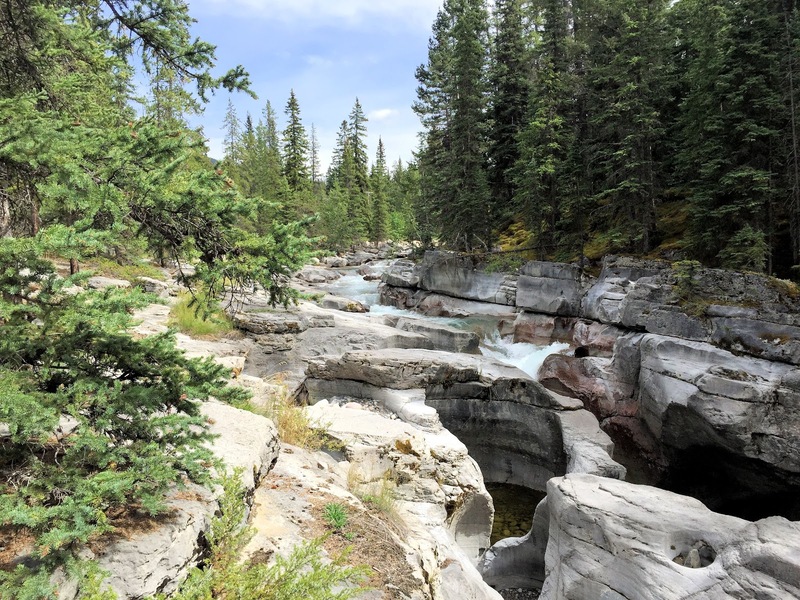 Encompassing more than 4,200 square miles, Jasper is Canada's largest national park in the mountain range and includes glaciers, mountains, lakes, hot springs and waterfalls. When we entered the park at the east gate around 1 p.m., we paid $90 CAD ($69 US) for two five-day passes, good through our time in Banff next week. 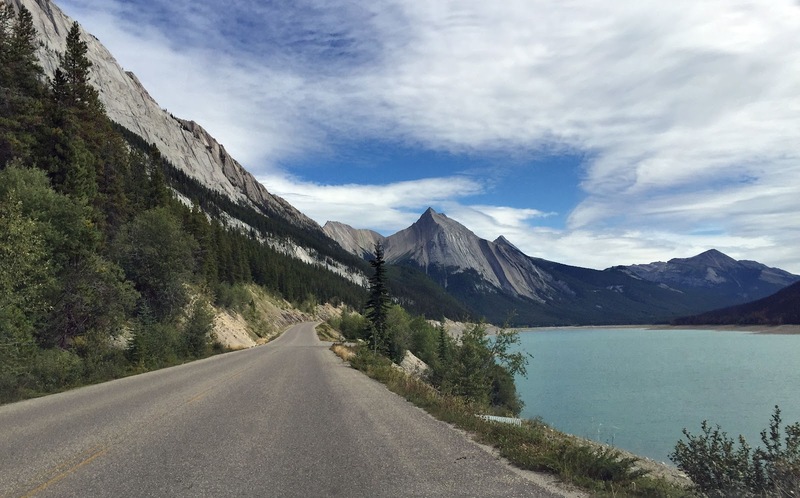 Once in the park, we followed Maligne (mə-LEEN) Lake Road through the Maligne Valley. 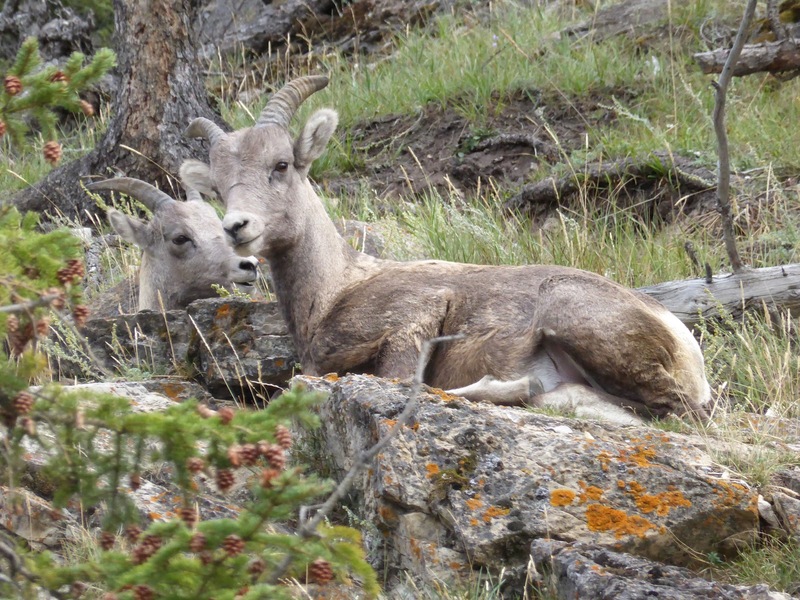 Jasper National Park welcomes more than two million visitors a year. Guessing that two-thirds visit in summer, we're estimating about 25,000 visitors today. Small wonder we had to troll for a parking space in the Maligne Canyon parking lot. 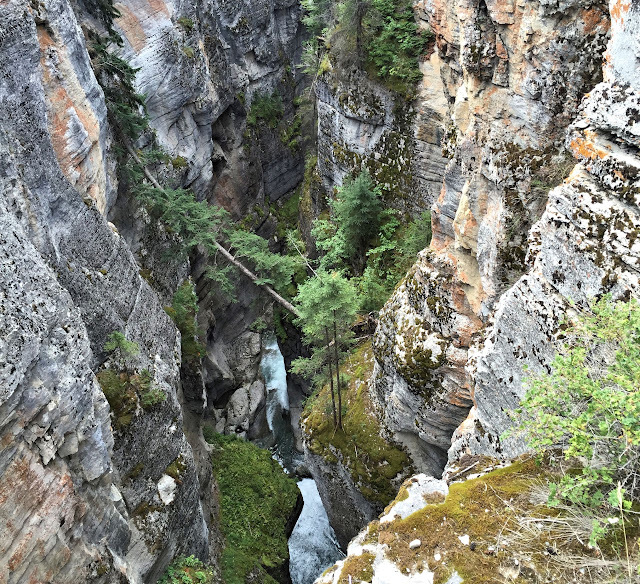 It was well worth the wait to view the Maligne River rushing 150 feet below through the limestone cliffs of the canyon. At other points, on the canyon trails, you could get a closer look at the river and canyon floor. Over the centuries, abrasive materials such as rocks and sand, swirling around in the turbulent waters, have eroded potholes in the canyon floor. As the river cut deeper into the canyon potholes are left above the stream in the canyon walls. By the time we left the viewing area, it was 3:30 and we were hoping to visit several other areas of the park today still. Checking the weather app, we discovered that the sun would not set until 9 p.m., leaving us plenty of touring time yet. On our way to Maligne Lake at the end of the 30-mile road, we passed the "mysterious" Medicine Lake, which appears each summer and vanishes by late fall. Sinkholes in the lake bed drain off more water than runoff is adding. 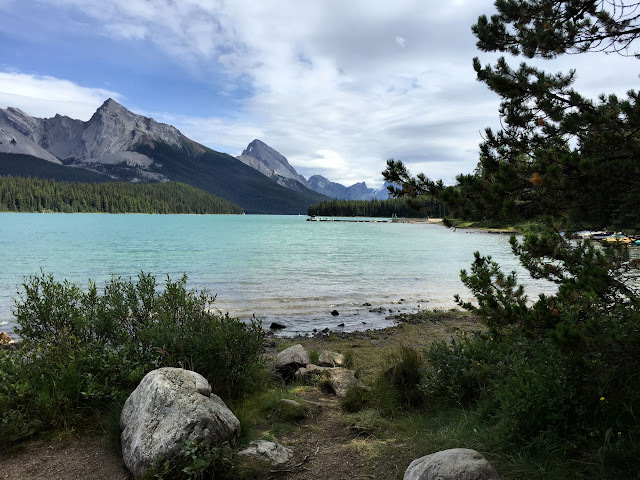 At the road's terminus, we found Maligne Lake, the largest natural lake in the Canadian Rockies at 14 miles long. 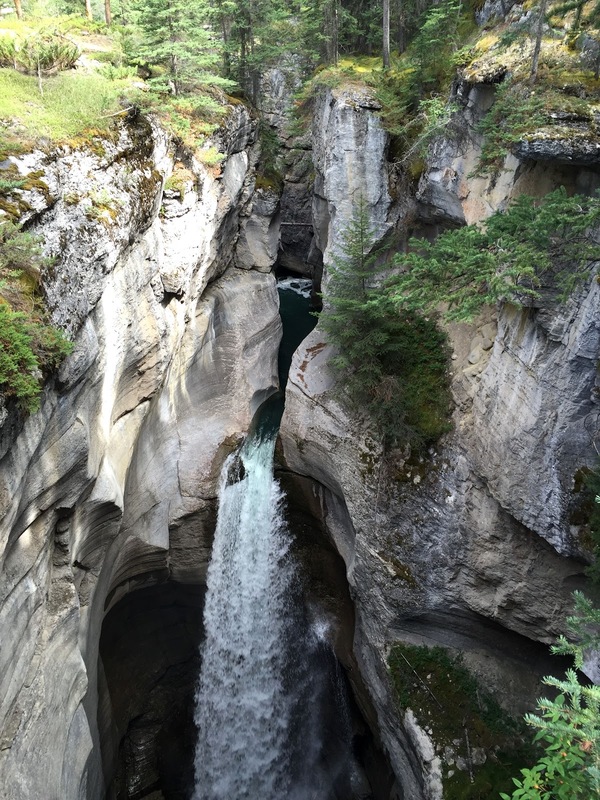 Fed by glacier melt, its waters are dammed by the second largest measured rockslide in the Rockies. Like other parts of the park, the lake was crowded with tourists today. 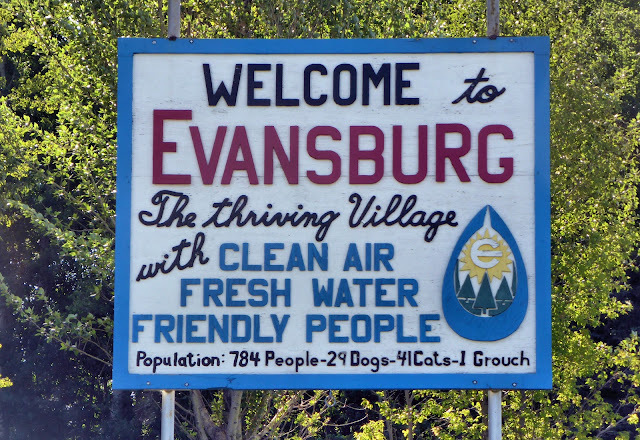 Between the clogged traffic—further delayed by a one-car accident—and a speed limit below 40 mph, it took us more than an hour to retrace the thirty miles of the lake road. 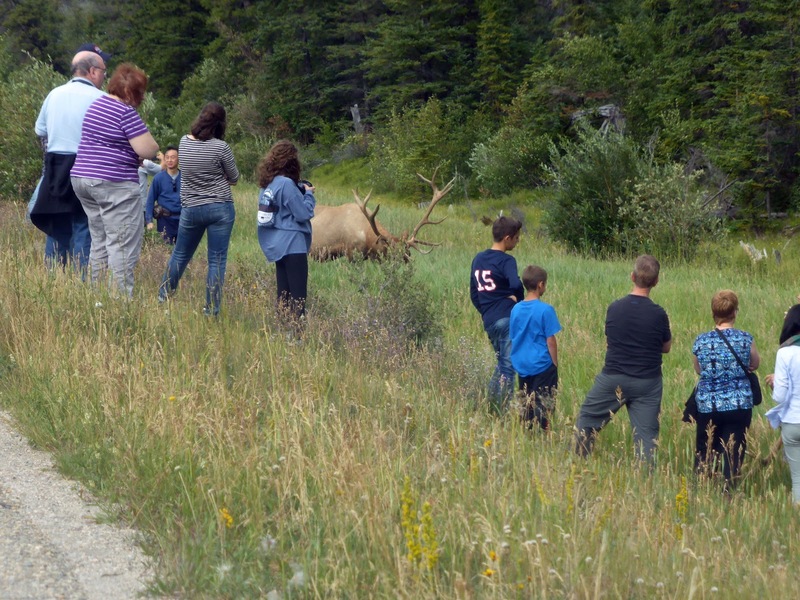 What part of "elks are dangerous wild animals who can maim and kill you" did these tourists not understand? We stopped briefly for information in the town of Jasper before returning to our hotel in Hinton. 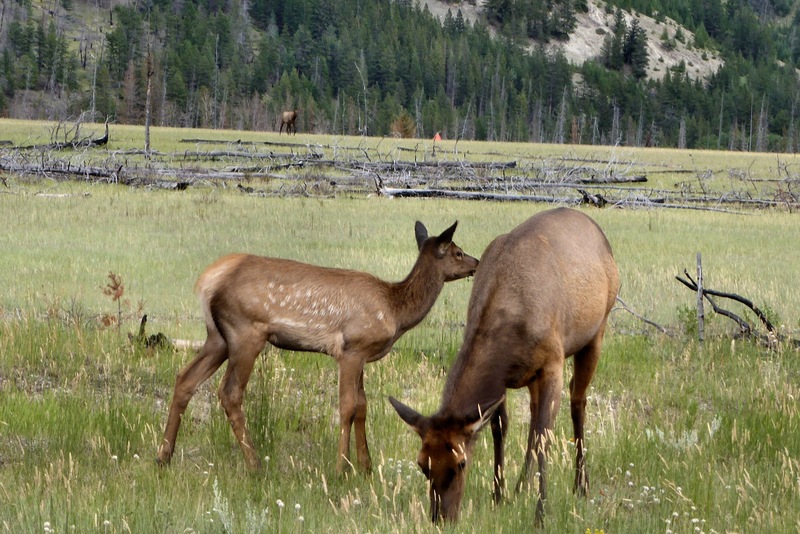 Along the way, we stopped (and remained in the car) to check out wildlife visible from the road, amazed as always by the risk-taking behavior of some tourists. Arriving at the Holiday Inn at 6:45, we were quite surprised to learn that our room was not ready. The frazzled housekeeping supervisor apologized profusely and arranged vouchers for free drinks while we waited. 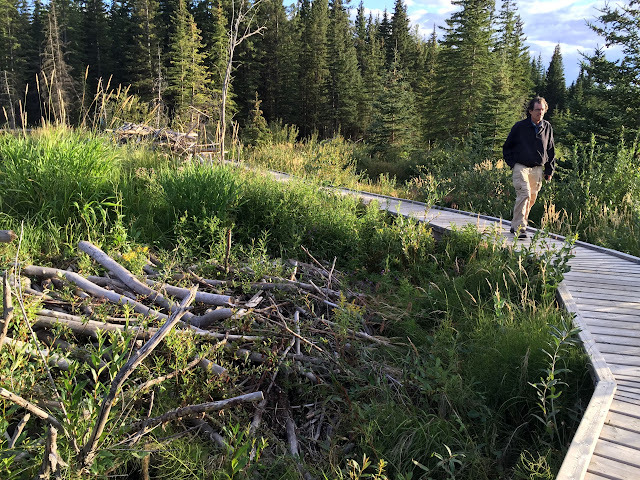 Half an hour later, we finally moved into our room but not before the barkeep Candace told us about Beaver Boardwalk, a unique trail winding through a nearby wetland with a fully functioning beaver colony. 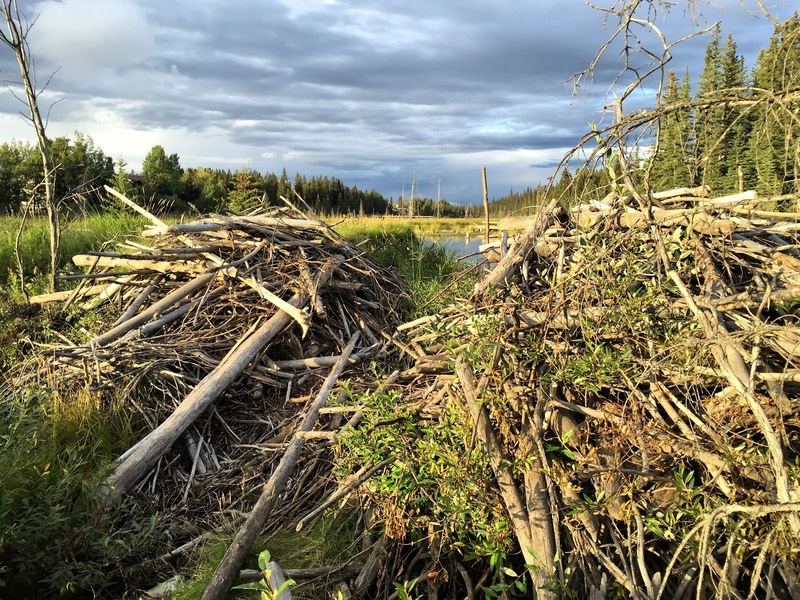 Though no beavers were active during our trek, there was ample evidence of their activity and resourcefulness. Back at the hotel, we cobbled together some dinner, which we finished around 9 p.m. 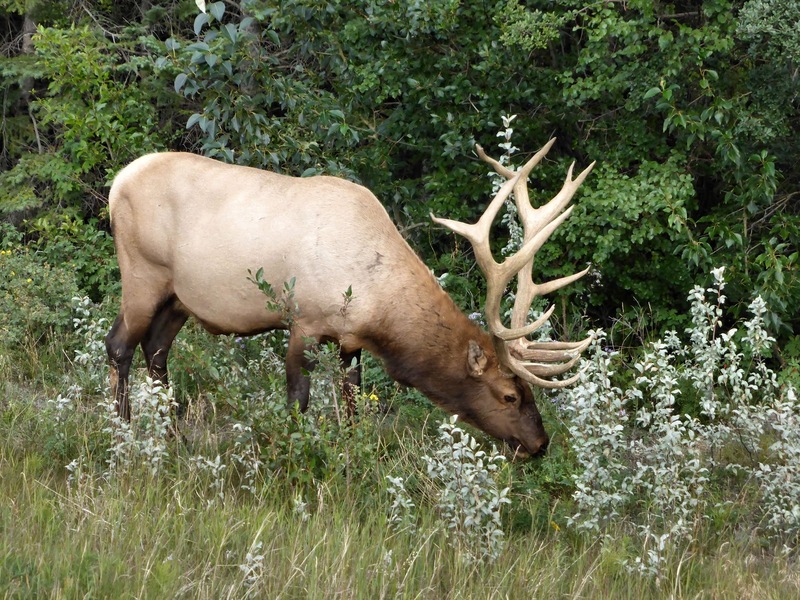 Tomorrow we'll return to Jasper National Park, spending the night at a lodge within the park. Would you approach this rack? Like other deer species, elk calves are born with spots for camouflage. Speaking of camouflage, these young bighorn sheep were challenging to pick out of the rocks.